5k version: 4:23:19; 8:27 pace; 9th overall, 3rd in age group. Great trail, great support and aid stations, and would definitely run again. The last few weeks of training leading up to the NF 50k went well – especially since the last two falls I sat on the sideline with a stress fracture. This year, the training went without too many hiccups and I was able to execute about 95% of my training plan. Over the last few weeks, I spent time running long, doing tempo runs, up and down the hills in the south of grand neighborhood, and running on single-track trails behind the Des Moines Art Center. 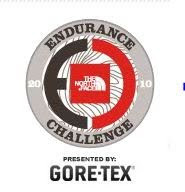 I had been running fast and was looking for a sub 4:30 50k dependent on the trail difficulty and weather conditions. My wife (and kids) decided to come with me to the event to see some friends that have relocated out to Milwaukee. My kids were excited to add Wisconsin to the states that they have visited. The trip up was pretty uneventful, and as we passed into Wisconsin, Ethan let everyone know that the Badger state looked way different than the Hawkeye state. With a short trip back to the Holiday Inn Express, the boys and I changed and we were off to the pool for quick swim. After that, Gabe pointed out it was the season premier of STAR WARS:CLONE WARS so we sat back and watched. Everyone was sleeping by 9:30. Perfect relaxing evening for the day before the race! The race started at 7 a.m., so I set the alarm for 5:15 to get something in my stomach (banana and cliff bar) and get dressed and prepared for the race. At 5 a.m. I woke up to booming thunder, lightning and heavy rain. Well, at least I wasn’t running the 50 mile that started at 5. Yuck - It looked like the storm was moving pretty fast, but the rain would make the trail course a bit sloppy for everyone. After the quick drive, we pulled up to start of the race. With it being chilly and raining, I left the family in the van, not sure if I would make it back to the van to wish them a good morning. They wished me well and decided to hang out for bit. I worked my way over to the start line, used a restroom one last time, and began to walk toward the start line with the skies once again opened up. It poured for a few minutes and started to taper off. I walked over to the start line when it let up and decided to camp under one of those portable patio heaters. The start of race went out about a ¾ mile stretch of flat road. I started out fast (marathon pace 7:16) and it was quick to see a couple of groups form at the front of the pack. Three guys went out really fast, and then there was another group of about 6 including me. The trail was in better shape than I anticipated but it was sloppy in places. After the fast start, I was about 7th in the placing up to the first aid station. 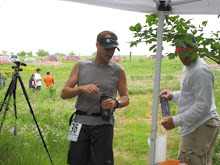 The first aid station was set up with water on the table first as you ran up to it, then the GU electrolyte drink, then the food and gels. I stopped at the water and handed my hand held water bottle to be filled. As I drank from a cup, the guy who was running 8th, shoved me out of the way to get to the electrolyte drink. I’ve never been pushed aside in a race like this before. Very UNCOOL. He passed me at the aid station along with another guy. I was mad. I decided right there that this guy was not going to beat me today. I still wanted to run my race and kept his lead in front of me in check throughout the race; keeping him within a couple minutes of him if I had to turn on the jets. I had one guy from the 40-50 age group pass me and I let him go. He looked strong, experienced, and was carrying plenty of fuel to get him through the race. I describe the type of body he had as one that is built like a shark in water – he had long legs, no body fat, and was built for speed. The timber lined trail turned to marshland/prairie. I slogged through a couple of spots where there was ankle high water in spongy grass. Another area was pretty much mud with no footing. The miles passed as I fueled myself on GUs, water, heed, and S-Caps. The race began to turn interesting around mile 24. I had kept behind “shover” for long enough and decided to make my move. I ran up upon him on a hill. He was walking and didn’t look like he had much left in the tank. I passed him and now regret that I didn’t give him “the look” made infamous by Lance Armstrong. I continued to run and eventually was caught by another 40-50 age grouper. He was running strong and we ended up running together for quite some time. He started the conversation when it started to rain for about a half hour with some lightning “This is F..ing great.” I hinted some sarcasm in his voice. From there, his conversational style only became a bit rougher. Yeah, I think three words were the limit before he must felt the need to insert some type of swear word. And I think he hit that limit twice during our 20 minute conversation. As we talked, some guy came ripping by us. We both looked at each other in amazement and wondered where this guy came from. We found out that he was a 50 miler and ended with a time of 6:15 minutes for 50 miles. Crazy fast… Anyway, the guy I was running with ended up about 30 seconds ahead of me and ran a great race. The rest of the race was pretty uneventful. I slowed a bit during the last 10 miles, but at that point, was concerned about hanging onto my place in the race versus trying to get too beat up along with making sure I stayed ahead of “shover”. I came into the finish and was happy to hear the announcer state “It’s dad!” as my two boys were cheering loudly for me. Overall, it was a great race, a PR at the 50k distance, a well supported trail run with great volunteers, and one that I hope to do again – OR maybe try the 50M distance…..